Unravel a few inches of thread, pull it to the left and wrap it round the front of the little nubbin sticking out on top of your machine. Thread a little up through the tiny hole in the top of the bobbin and wrap it round a few times so it’s unravelling round the back and towards the left. Place the bobbin on the bobbin winder - the small prong on the right of the machine. 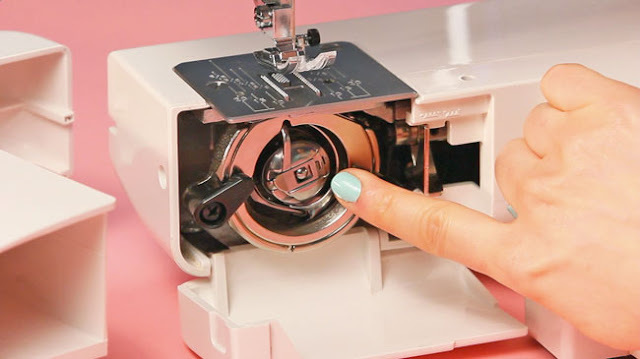 Depending on your machine, to secure it in place you'll either flick the bobbin winder towards the right or flick the stopper next to it towards the bobbin. On many machines, if you pull out the handwheel on the right of the machine you can wind the bobbin without the needle going up and down. On other machines you don't need to do this - the machine already knows you're winding the bobbin because it's flicked towards the stopper. 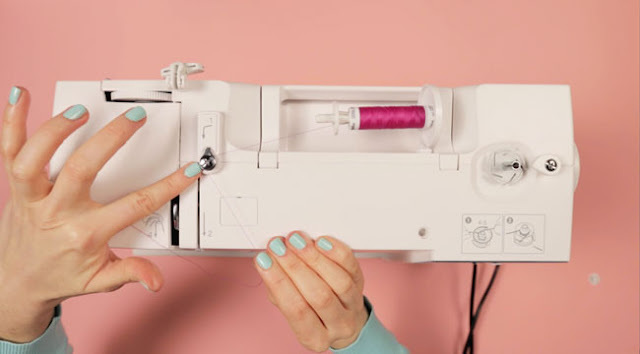 Switch your machine on and, holding the thread sticking out of the bobbin for the first few seconds, press your foot down on the pedal to start the thread winding from the spool onto the bobbin. 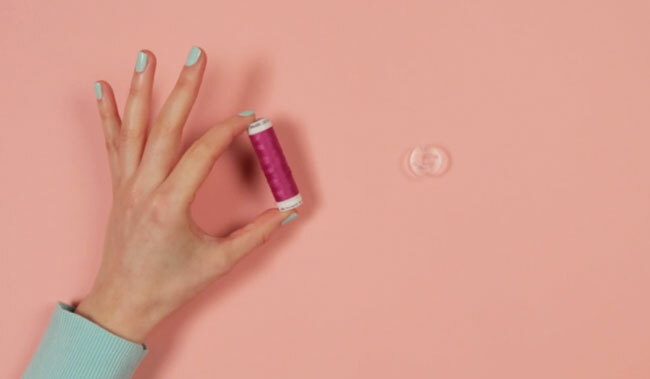 Keep an eye on it - if the thread ends up on the bobbin winder rather than on the bobbin itself, you may need to switch the direction the thread is being wrapped, or just make sure you're holding the thread for the first few seconds. Keep winding until the bobbin is full of thread (or as much as you need). Snip the thread to separate the spool and bobbin, before flicking the bobbin winder to the left to remove the bobbin. 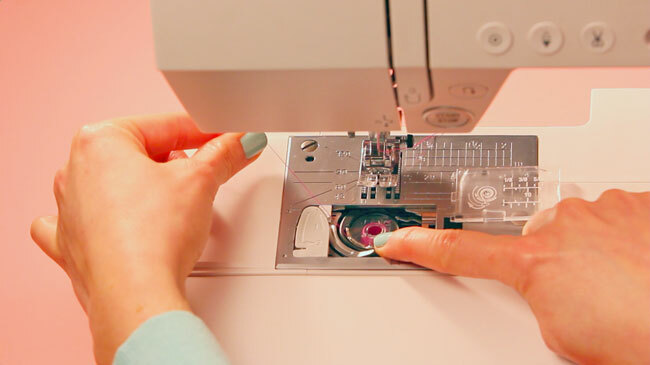 Now turn your machine off so you don't accidentally sew over your hand doing the next part! 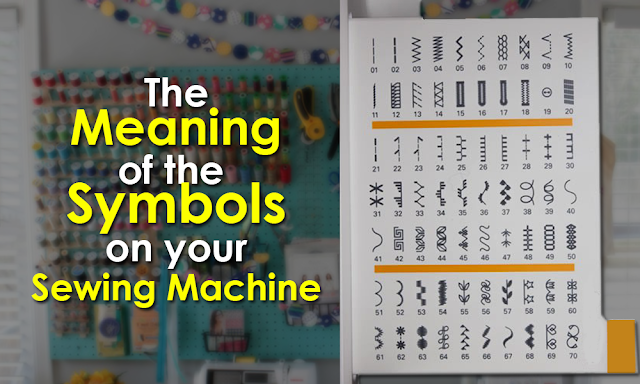 Now to thread your machine. We'll start by threading the spool from the top. The thread should be coming out from behind the spool towards the left. First things first - take the thread off the little silver tension discs - those are just for winding the bobbin and will make your stitching really tight if you accidentally leave the thread on there. 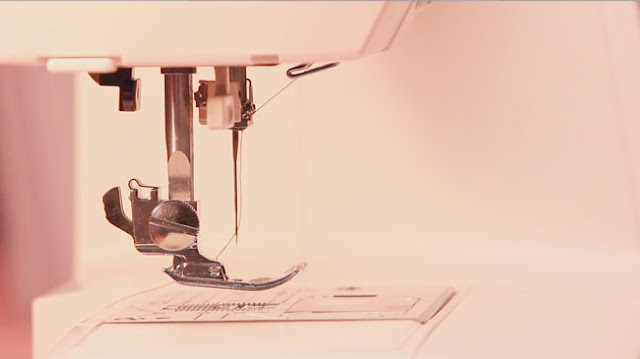 You machine may have a hook or two on the top that the thread needs to go around - check your manual if you're not sure. Now you need to guide the thread down to the needle - your machine will probably have arrows directing you so you can’t go too wrong. Guide it left to right - pull it round to the left of the first hook, then down through the first ditch, up the left side of the second ditch, through the eye of the second hook, and back down the second ditch on the right side this time. At the top of your needle, there will be one or two hooks (check your sewing machine manual if you're not sure). Secure the thread behind these hooks. 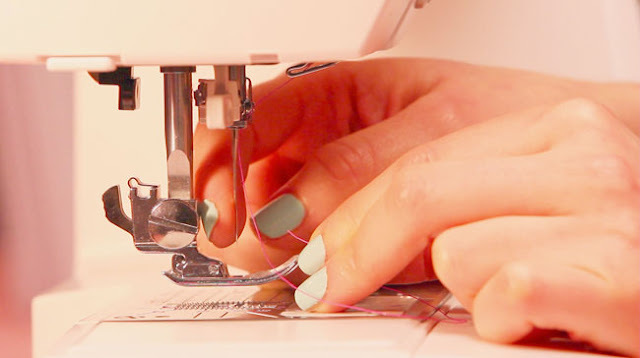 Read my tips on threading a sewing machine needle. This machine I'm showing you here (not my regular one) is front-loading. 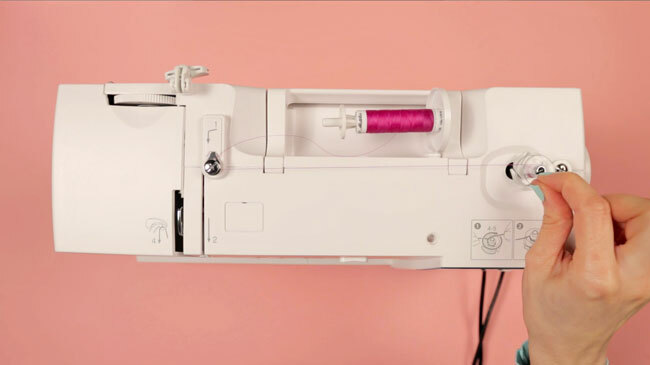 Remove the arm on the front left of the machine and flip down the cover to reveal the bobbin holder. Pull the bobbin case out – this is the silver thing in the middle. On this machine, you hold the bobbin so the thread is unwinding in a clockwise direction – but do check your manual in case it’s different on your machine. Drop it this way up, down into the case. 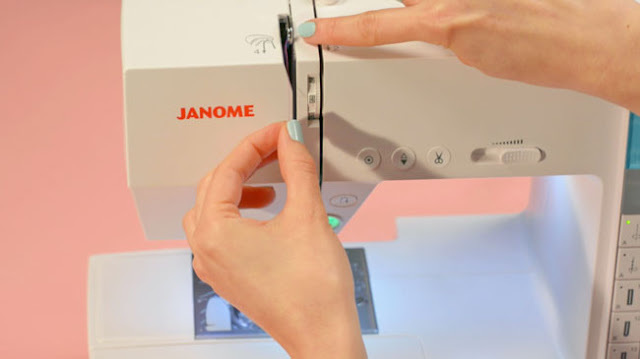 Pull a few inches of thread down the tiny slit and and out through the side, before placing the case back in the machine. 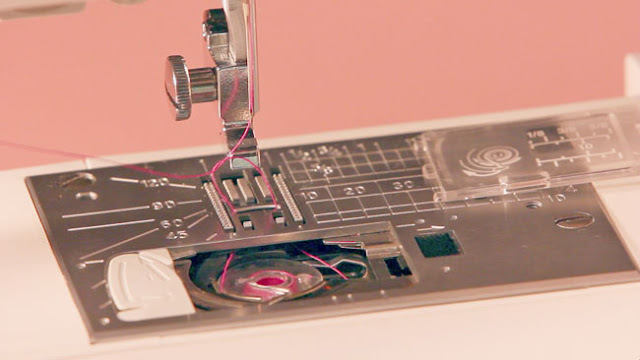 On a top-loading machine, the bobbin case is fixed inside the machine, just in front of the needle plate. First, take off the little plastic cover by flicking the button on the right to the side. Hold the bobbin so the thread is coming out anticlockwise if you’re looking at it from above. 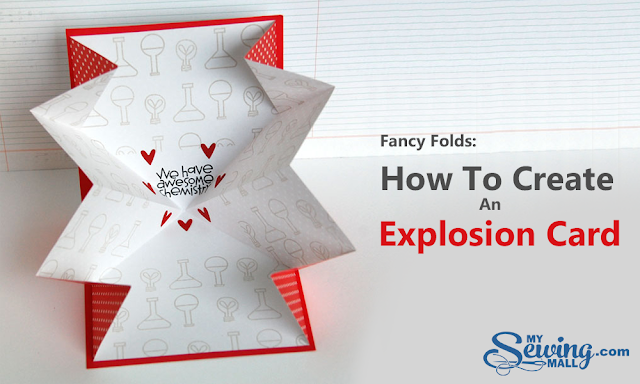 Plop it into the case. There's a little groove at the front of the bobbin case (the silver bit surrounding the bobbin) - pull the thread through this hook and off to the left. The last thing to do is get the bobbin thread up to the surface of the machine, using the spool (top) thread to fish it out. 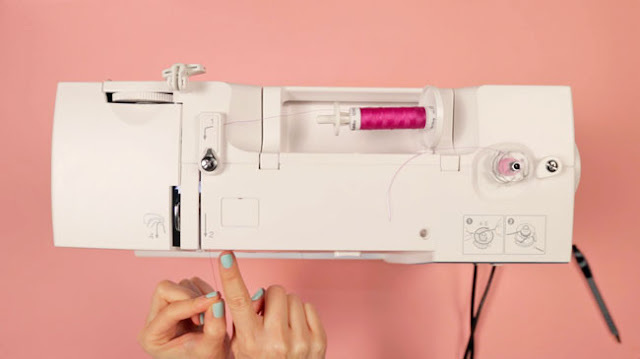 Holding the spool thread in your left hand, turn the hand wheel with your right hand for one rotation to move the needle down and up again (or press the needle up-down button twice if your machine has one). Now gently tug on the upper thread with your left hand and a loop of the bobbin (lower) thread should emerge to the surface with it. 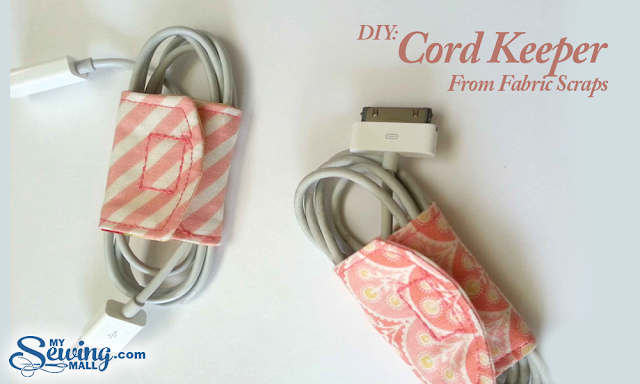 Pull this loop of thread out - that's your bobbin thread. Close the cover, put the arm back on your machine... et voilà! Before you do that, it’d be a good idea to pull your thread out from whence it came and practise rethreading a couple more times. I promise that, once you do that, you’ll realise that it’s actually a quick and easy procedure, and not as complicated or time-consuming as this long tutorial makes it seem!